Boracay is a scenic island located in the Philippines and it is approximately 315 km from South Manila. Many travel agencies and publications awarded Boracay Island for its beaches. This small island encompasses many beautiful beaches and conducts great parties. The beaches are with incredible soft white sand. Tourists may enjoy the cool breeze with weaving waves in Boracay beach and it has been a social place for get-togethers, resorts, and friendly people. It won the first place in the top of the best islands in the world list published by the top of the Best Islands in 2014. DOT data showed that 1,560,106 visitors visited this 1032 hectare island in 2015 which was 5.96 % higher than 1,472,352 visitors in 2014. The tourists have to pass through the port in Caticlan before reaching Boracay. The Government charges an environmental and terminal fee when arriving at the Caticlan. Php 75 is an environmental fee and Php 50 is the terminal fee. Senior citizens and students have to pay only Php 40 as the environmental fee whereas children need not pay any fee for entering into the island. November to May is the best time to visit Boracay. The temperature falls between 25 Â° and 32 Â° C during the time and it seems mostly dry. This season makes the place as a perfect vacation spot to enjoy as couples and families. However, during this season the accommodations are quite expensive and the tourists may better book the hotels or restaurants in advance to enjoy the season hassle-free. This fascination location is located just off the east coast beach. Plenty of shells, corals, and starfishes are around between Boracay Rock and Little Boracay Rocks. It has been a favorite spot for the local residents. There is a large coral shelf which has umpteen varieties of living corals in different shapes and sizes on the southern end of the white beach. The self is exposed above the water level. This wonder coral and cost line are the perfect location for photographers. This museum is located at Ilig-iligan village. It has a huge collection of woodcarvings, pottery, seashells, and traditional costumes of Philippines. Boracay Butterfly Garden is at Bolabog Beach which is five minutes away from Dâ€™Mall. Many students are visiting here for educational tours to know about the butterfly life cycles, eggs, caterpillars, pupae. Local people are selling handicrafts and plants in the butterfly farm. 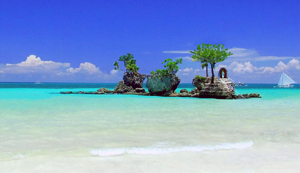 Other than the above Mount Luho, Naked Rock, Willy’s Rock, Caves, Dead Forest and Wooded Area, and Gateway Arc are the beautiful viewpoints in the Boracay Island. Scuba Diving, Parasailing, Standup Paddling, Fly Fish, Cliff Diving, ATV Ride, Mermaid Swimming and Sunset Watching are the favorite spots to enjoy on this beautiful Island. This scenic island is also famous for massage, henna tattoo, beach sports and night swim. The island is indeed well maintained and beautiful! I do love the sunny weather, clean and blue waters. However, a gentle note to be wary of local agents and scammers who is out to sell you pricey packages for the water activities along the white beach. They are not very transparent about all the additional costs on top of the initial (high) package prices such as snorkelling googles and even insurance fees and would make you go through them to get all these later at marked up prices.